I love being a Red Letter Days Blogger Ambassador. I’ve met Cake Boy, done indoor skydiving, and had tea with a tiger! 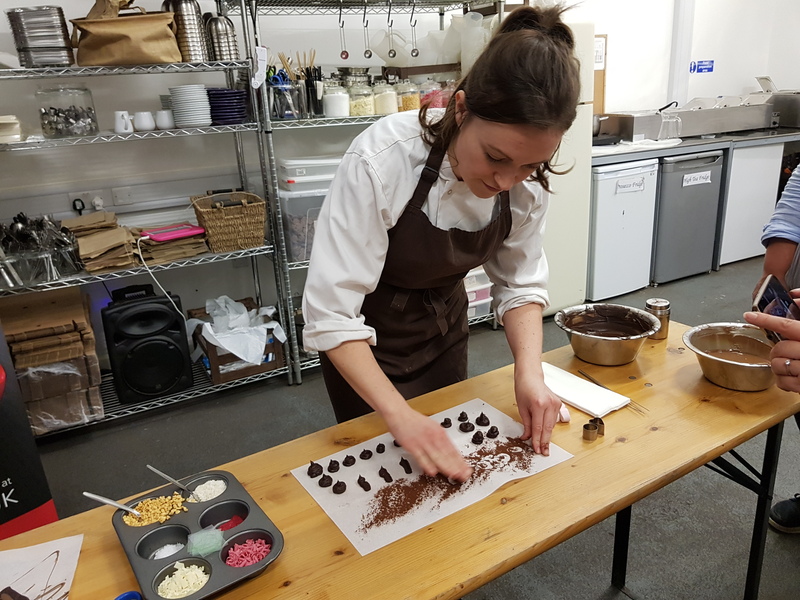 My next assignment put a dink into my diet – an evening at MyChocolate for a Luxury Chocolate Workshop with Bubbly! The event started brilliantly – making Chocolate Martinis! We were taught how to drizzle the chocolate around the inside of the glass. Considering it’s meant to look a little ‘messy’ it was harder than it looked. Most of the class managed to make theirs look good – mine, well – didn’t! We were given alcohol and instructed the desired quantities to put in the cocktail shaker, alongside some perfect liquid chocolate and cream. I was in charge of measuring, another member of my group was in charge of ‘shaking’. With some careful pouring, we all had some delicious chocolate Martinis to enjoy – not before doing a ‘Cheers’ Boomerang for Instagram! Next on the agenda was making a giant chocolate button. It didn’t have to be button shaped – it could be anything! I chose to make a bear – It’s a pretty simple shape. We scooped melted chocolate onto some parchment and shaped it with a spoon. We were shown how to ‘marble’ the chocolate for decoration – I just used some extra dribbles of chocolate to add features. These were set aside to set. I was pretty pleased with the result. The next part of the Workshop was the truffle making. We mixed melted chocolate and cream and formed a thick ganache. This was then put into a piping bag and small ‘mounds’ of chocolate piped onto parchment. I’m not going to lie, it looked like a miniature incontinent dog had strolled across the table. I was reassured that it they’d end up looking and tasting better. get in! From super high quality, to some cheaper stuff. There are over 400 flavour notes within chocolate – to be fair I enjoyed all of them. I think I could definitely be a chocolate connoisseur! We turned back to our truffle creations and rolled them into balls (with cocoa powder on our fingers to stop sticking). 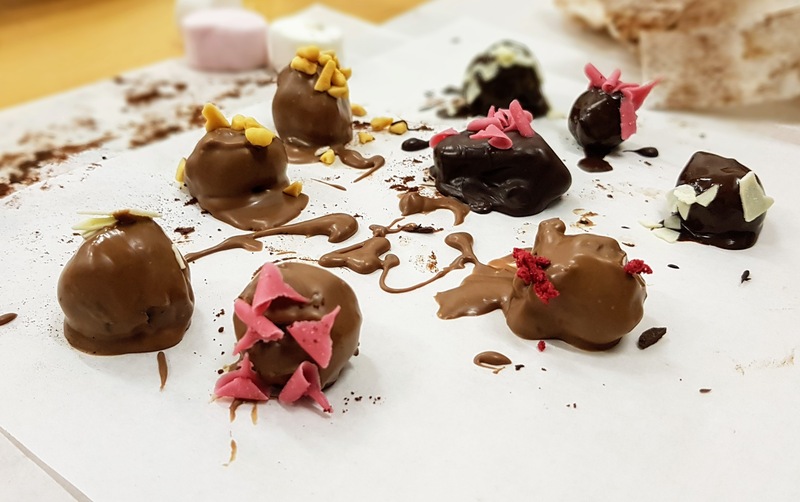 They were then dipped into milk or dark chocolate, then added some sprinkles of flavour – these included honeycomb, sea salt, raspberry flavouring, and white chocolate curls. Mine didn’t look particularly pretty, but I was pleased with how they looked for a first attempt. We were given some nice packaging to take our creations home in so they wouldn’t be destroyed on the journey home. Perfect! I had an amazing night with the Red Letter Days team, and the wonderful staff at MyChocolate. The workshop was a lot of fun, and ran with military precision – I’d love to go back again to hone my skills further. I am a bit useless with fiddly stuff like this, however the instruction was very helpful, and even a luddite like me could produce average results. Sadly (!) the truffles needed consuming within 2 days, so I HAD to scoff them. They were flipping delicious! As mentioned – I’m a Red Letter Days Ambassador – however, all thoughts and opinions are my own, and completely honest! Kippeh gets (vaguely) Political and has fame!